These are the page numbers of the other Ellis Island pages: 22, 23, 24 & 25. 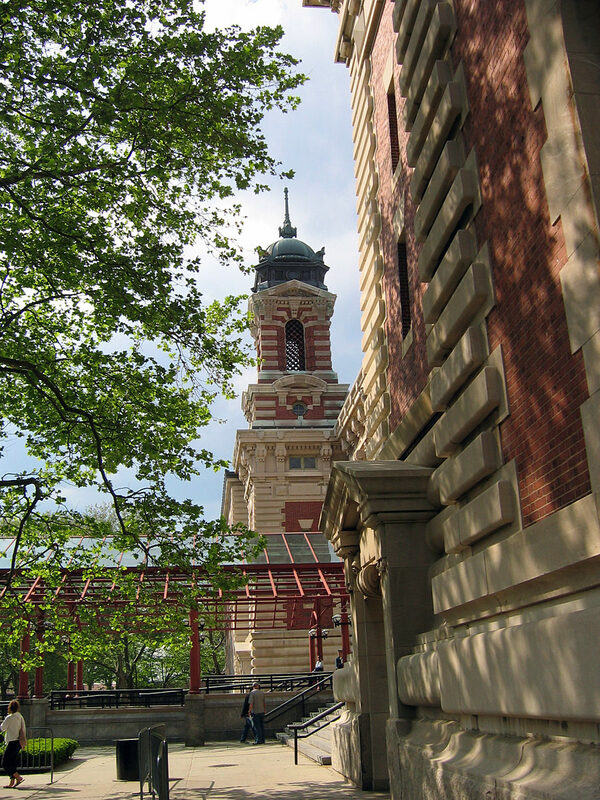 I hope that you will enjoy the next image of the front of the main building on Ellis Island today. It is, in fact, a small version of a much larger copyrighted (� Copyright 2006 FreeLargePhotos.com) image. - reduced on this page so you can see it in its entirety without scrolling. The full size image is available through this page, where you can i) read that image usage on a non-profit site such as this is kindly permitted & ii) access the image. Large as it is, an even larger image would seem to be available upon request. More images are available at that site also on their Ellis Island index page. Including one great image of the arrivals hall. No less than 2,837 large quality images, on a whole host of subjects, are available here. Do drop by! Another Ellis Island image, taken from the water, is on the second New York City page. From this site, the website, it would seem, of Dr. William Rogers of Drew University of Madison, New Jersey, comes the following image. I thank you, Dr. Rogers! But the true origin of the image, i.e. where it was originally published? I do not know that. And do not even know whether it relates to New York at all. It surely would predate Ellis Island by many decades. But I include it, regardless, because it is visually most interesting. Via an image search, I found the following image, which is splendid indeed. It came from this page where it has a caption that indicates it is of immigrants waiting to be transferred to Ellis Island. The site would seem, despite its address, to be from Flagstaff, Arizona, & the image would seem to be the result of the efforts of a student there (�l�ves are students, I believe). The image seems to have 'FFG International', if I read the small type correctly, recorded beside it. And if that organisation owns the rights to the image & would prefer it be removed from these pages I will gladly do so. Actually not so gladly - because the image is wonderful & so appropriate for inclusion here with all the other quality images which grace this & earlier pages. It would be good to know the date of the image, wouldn't it! The hats that many of the women are wearing (such as the ladies in the left bottom & right bottom corners) are most familiar. I have seen images of my long departed mother wearing such a hat in her youth. An image of a Polish immigrant boarding a ship. Ex the archives of the Library of Congress - here. The words at the bottom of the image are not complete but it would seem that the man was boarding the President Grant, built in 1907 at Belfast by Harland & Wolff. More in the future, I am sure.